Plain (no graphics) Crossed Checkered Racing Flags Batman Dark Knight Rises Old Batman Graphic punisher symbol bulldog artistic horse tiger head pair of dragon eyes ZOOM ZOOM ZOOM TURBO TURBOCHARGED SUPERCHARGED mickey mouse pair of dolphins flames Superman Symbol Transformer Symbol solstice side silhouette saturn sky car front profile solstice front profile saturn rings yin-yang symbol Harley Davisson symbol lightening bolt skull and crossbones 3 lined up hearts 5 lined up hearts 3 lined up diamonds 5 lined up diamonds 3 lined up spades 5 lined up spades 3 lined up clubs 5 lined up clubs spade-diamond-heart-club SSR (flag)GXP dragon (as shown in pic) BMW Logo Z4 BMW Z4 BMW BMW Z4 side silhouette ssr silhouette Porsche logo with word "PORSCHE" in it Porsche logo with word "BOXSTER" in it Porsche logo with word "BOXSTER S" in it only word "BOXSTER" only word "BOXSTER S"
Pick from several etchings to customize your Porsche Boxster. 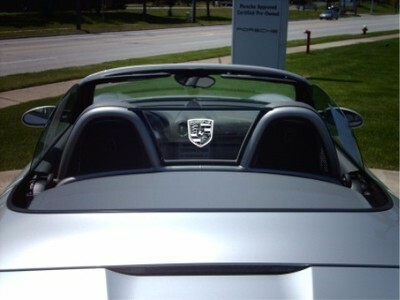 Our Porsche etched screen will add to your car's beauty and style. Send us your stock polycarbonate screen and we'll etch and return it in no time. Polycarbonate screens can't be lit, just etched.